A deeply distressed banker enters 221B Baker St. His safe has been robbed and he is certain that his motorcycle-riding sons have betrayed him. 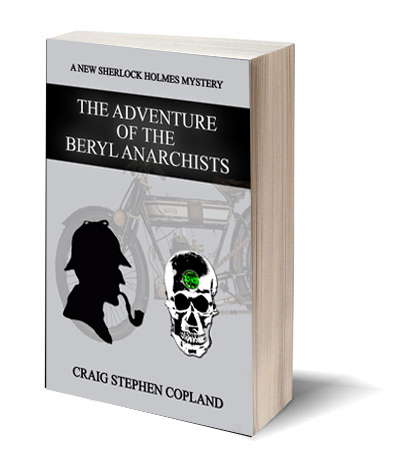 Highly incriminating and embarrassing records of the financial and personal affairs of England’s nobility are now in the hands of blackmailers – the Beryl Anarchists they call themselves – all passionately involved in the craze of motorcycle riding and in ruthless criminal pursuits. And then a young girl is murdered. Holmes and Watson must find the real culprits and stop them before more crimes are committed – too horrendous to be imagined. This new mystery was inspired by The Adventure of the Beryl Coronet and borrows the setting and some of the characters. And, of course, our beloved Sherlock Holmes and Dr. Watson are there, just as they are in the original Canon.